So Manny has officially left the building, joining the All-Dodger outfield in Chicago with Juan Pierre & Andruw Jones. While some local media are wishing Manny good riddance, YKI has no animosity toward Manny Ramirez. Dodger fans were the benefactors of the most exciting second half (season?) in recent Dodger history, on the back of Manny(wood) and his dreadlocks – consistently providing power & excitement that YKI doesn’t recall seeing at the Stadium. Of course the 2009 Fertility Drug fiasco put a damper on the ‘legacy’ of Ramirez, but he still put up good numbers in the games he played (.290/16/63), an effect that continued this year despite copious injuries. Was he worth $45mm? Probably – he put asses in the seats and balls into the Pavilion. And guess what? The Dodgers were the focus of the baseball word for reasons other than the heinous McCourt divorce for the greater part of his tenure. 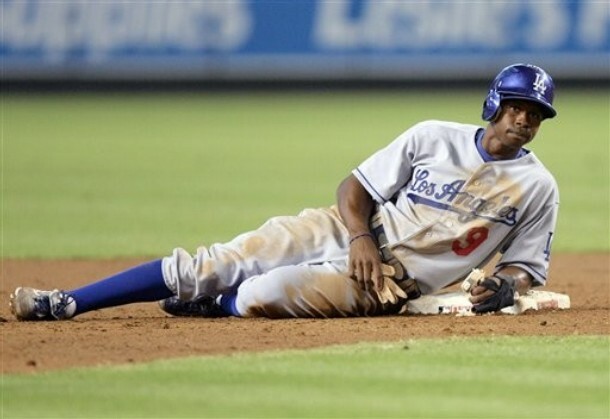 Lastly, we know this was coming – we’re fortunate to have been part of the resurrection of Chavez Ravine, and there was a definitive expiration date on his viability. That was exceeded, and Colletti dumped the salary and furthered his reputation as the best damn penny pinching big market GM in the game. Good work, and good luck to Manny. Thanks for the Memories. Scott Podsednik. . .Juan Pierre? Dodgers traded Lucas May + Eli Pimentel to the Royals for . Scott Podsednik is a good ballplayer, but reminds YKI of . I certainly loved Juan Pierre’s heart, and though his lack of power was disturbing during the majority of his career, the game is becoming ironically more-suited toward his skill set. . .which is remarkably comparable to Podsednik’s. I know ScottPod was part of the 2005 White Sox World Series champions, so he is a gamer that will bring a competitive fire – and great set of wheels – to the Dodgers. The question is. . .was the acquisition due to the fact that Colletti knows that Manny Ramirez is injured (checked out?) for longer than the Dodgers are letting on? We’ll see – and now on to the pitching acquisition. . . The L.A. Times’ Kevin Baxter reports that Juan Pierre is happier and freer in Chicago. Good for Juan, whose career was nearly derailed the day he signed with the Dodgers for that monstrous contract (for a leadoff hitter, low OBP, etc). The Manny Ramirez signing almost rendered him obsolete, but he proved his worth – and won Dodger fans hearts – by filling in admirably during Manny’s suspension. The ironic thing? As a stop gap, he did what he ALWAYS does – hit, score runs & steal bases. His great attitude and professional approach was definitiely appreciated by YKI. White Sox acquire OF Pierre from L.A. 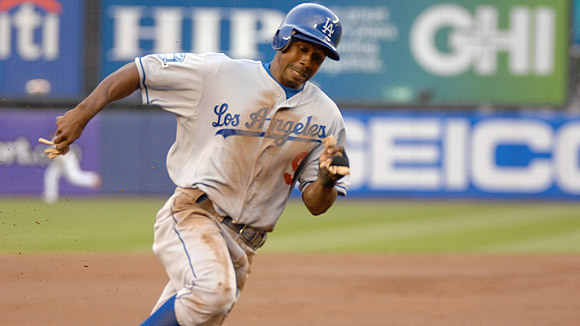 The Chicago White Sox acquired outfielder Juan Pierre from the Los Angeles Dodgers for two minor leaguers and cash. Maybe now he’ll once again get a chance to get the playing time he deserves. I can’t say I feel bad for him, per se, as he was paid handsomely to be a fourth OF for the Dodgers, but the fact is Juan Peezy had a borderline Hall-of-Fame chance (guy is a 200-hit machine, had 1,500 hits by age 29) until Joe Torre took the bat out of his hands. Through all of the tumult in L.A., Pierre worked hard and handled himself with class. He will be missed by true Dodger fans. Of the $18.5 million left on Pierre’s contract, the White Sox will pay $3 million in 2010 and $5 million in 2011, sources said. The Dodgers will select two pitching prospects from a list furnished by the White Sox.